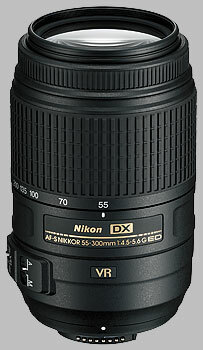 The 55-300mm ƒ/4.5-5.6G ED VR was introduced in August 2010 as a new telephoto zoom lens companion to its 18-55mm wide-angle zoom lens. Nikon already has two consumer-grade telephoto zoom lenses: the 55-200mm VR and the FX-capable 70-300mm VR. On a Nikon digital body with an APS-C sized sensor, the lens will give an effective field of view of approximately 80-450mm. The lens vignettes when mounted on a full frame body; you'll see black circular edges on either side of the image. As a G-series lens, there's no aperture ring, so it may not work properly on a film body that can't set the lens aperture. Dealers tend to make the lens available as part of various body and lens kit, or on its own for around $350. The lens ships with a lens hood, and accepts 58mm filters. As with most lenses the optimal results are achieved when stopped down - in the case of the 55-300mm VR, to ƒ/8 or ƒ/11. Best results for sharpness seem to be achieved with the lens set to either 70mm or 100mm and ƒ/8, where sharpness is tack-sharp across the entire frame. When used at its widest apertures, the lens' performance is somewhat uneven; it needs to be stopped down even by one stop to achieve consistently sharp images across the frame. Results when used wide open at 200mm and below are decently sharp if uneven, at around 2 blur units; at 300mm, it's not as uneven, but corner softness moves up to 3 blur units. Close the lens down by one or two stops, and it finds a happy place. As we've already indicated, it's happiest in the wider region of its zoom range; performance is still very good at 135mm, but at 200mm or 300mm sharpness never gets better than 2 blur units, even stopped down to ƒ/8 or ƒ/11. Diffraction limiting sets in at at ƒ/16; fully stopped-down performance is acceptable at wider focal lengths, but at 135mm and longer, it becomes quite soft; at 300mm and ƒ/29, we note around 6 blur units across the frame. The lens shows good resistance to chromatic aberration. Chromatic aberration is present at the wide angle (55mm) when the lens is stopped down considerably, but is very low indeed until around 135mm. At 200-300mm, chromatic aberration begins to become problematic, especially in the corners. Please note that the CA results for 300mm aren't currently available, but will be posted shortly. If corner shading is an issue at all, it's when the lens is used at its widest apertures, and then, at 100mm or longer; even then, we note corners that are only 1/3 EV darker than the center. Stopped down, corner shading is negligible. Distortion results for the Nikon 55-300mm ƒ/4.5-5.6 are typical for this class of lens, showing a complicated mix of both barrel and pincushion distortion in the longer range of its telephoto focal length. Between 55-67mm, distortion is slightly barrelled, at around +0.3% in the corners; the lens reaches a kind of parity around 62mm. After this point, the corners show pincushion distortion while the central region shows some slight barrel distortion. At its worst, we note almost -0.5% pincushion distortion in the corners above 135mm; similarly, almost +0.3% barrel distortion distortion throughout the image above 100mm. Despite being an AF-S lens, the 55-300mm ƒ/4.5-5.6 is relatively slow to autofocus. Our non-scientific testing puts it at around 1.5 seconds to rack through near-far focus on a D300s body. Manual focus is selected with a dedicated AF/MF switch: despite being listed as an AF-S lens, you can't override autofocus by just turning the focus ring, you have to switch to manual focus mode. In this case, the AF-S term just means the focus motor is built into the lens. Further, the front lens element will rotate during focus operations, making the use of polarizing filters that much more difficult. Macro results are fair for this lens, with a magnfication of 0.28x, and a close-focusing range of 1.4 meters (around 4 and a half feet). The 55-300mm ƒ/4.5-5.6 is composed of polycarbonate plastic, with matte black finish, a metal body mount and plastic filter threads. As an advantage this makes the lens quite light (580, 18.7oz) and easy to handle; however, it doesn't feel as robust as Nikon's more expensive lenses. It doesn't feel cheap; it just doesn't feel as ''solid'' as one might hope. That said, Nikon's figured out what to keep and what to leave and out and still leave the lens economically priced: features such as using 9 rounded diaphragm blades in the aperture to deliver smooth out-of-focus elements; using 1 High Refractive Index and 2 ED elements in the optical design; and a tripod-sensing VR system. The lens has two control features: a switch to enable or disable autofocus, and a switch to enable or disable vibration reduction. The lens does not feature a distance scale, depth-of-field indicators or infrared index. The lens takes 58mm filters: as mentioned, these will rotate during focusing. The zoom ring is considerable, about one and three-eights inches wide, with well-textured raised rubber ribs. It provides a nicely spaced zoom selection, rotating 90 degrees through its range. The lens will extend about one and five-eights inches during its zoom range. Zooming action is very smooth but nicely dampened; the lens won't creep at all. The focus ring feels like a bit of an afterthought, a ribbed rubber ring a quarter-inch wide. The ring offers ninety degrees of focus travel, with hard stops on either end of the spectrum. It's worth noting that there's some slight lens extension during autofocus, with the lens barrel protruding an additional 3/4 inch at 300mm. It's not impossible to achieve accurate manual focus, but it's definitely harder than it needs to be. Clearly, this is a lens that's not intended for anything but autofocusing. That said, autofocus, while dependent on the body, is very accurate. The lens features vibration reduction, and in practice, it works quite well - see our IS Test section for full details. In short, it doesn't quite offer the 4 stops of shake reduction as advertised, but it does offer some benefit. The lens ships with the HB-57 hood, a rounded hood that offers protection from flare. The lens can be reversed and mounted on the lens for storage; when mounted, it adds 1.5 inches to the overall length of the lens. We've limited our alternatives to image-stabilized telephoto zooms. The Sigma is on par with the Nikon for sharpness, corner shading and distortion; the Nikon handles chromatic aberration much better. The Sigma doesn't offer the extra reach of 300mm, but it is a third-stop faster at the wider 50mm. Also, about half the price of the Nikon. Tamron doesn't offer a comparable telephoto zoom with image stabilization; its closest offering in the same range would be the 55-200 ƒ/4.5-6, which we have not yet tested. The 18-270mm offers Vibration Compensation (VC), and a similar zoom range. The sharpness and CA profiles are quite similar to the Nikon; good in the mid-range, but poorer when zoomed in to its full extension. Distortion is of course somewhat different, as the lens has a very wide range of focal lengths to contend with, and vignetting is about the same. More expensive than the Nikon, though of course, you get a whole range of wide-angle thrown in as well. Considering the price point, you do get a good deal of lens for the money: it's fairly sharp wide open, sharper when stopped-down, and other traits such as tolerance to chromatic aberration, corner shading and distortion are as good or better than you'd expect for a lens in this class. It's not quite as good as its predecessor 55-200mm, but then, it's not just a matter of tacking on an extra 100mm of focal length; something's got to give, and thankfully, there's nothing that gives too much to make that happen. For the money, the lens makes an excellent companion to an 18-55mm for a two-lens system that runs the full gamut of wide-angle to telephoto. I bought this as an inexpensive backup for my 70-300, and was surprised at how close its performance is to the bigger lens. I will now use it almost exclusively with my D7100 and move the 70-300 to my D610 bag. My first comparison, of course, was with the 70-300. I took dozens of pairs of shots of a distant mountain on a clear day to see where this lens begins to lose resolution relative to the 70-300. At 200mm it's very difficult to see any difference. At 250 the 70-300 is only slightly sharper. At 300, there is a difference, but not really very much. This lens works perfectly on the D7100 in ordinary mode, crop mode, with a Kenko 1.4x teleconverter and even with the TC in crop mode. The only problem encountered as I reached those extreme focal lengths was holding the camera steady enough to avoid slight shake, which is easy to mistake for lack of resolution. I think most of the lack of sharpness at very large net focal lengths is movement, possibly mirror slap, rather than any great deficiency in the lens' optics. The 70-300 does somewhat better at these long focal lengths in this respect, simply because it's a heavier lens and, thus, steadier to hold. I also tried the lens on my D610 in DX mode. It works perfectly with and without the 1.4x Kenko TC, which also autofocuses perfectly, as it does on the D7100. That surprised me. I knew it would autofocus on the D7100 with the TC, but didn't expect almost identical results with the D610 in DX mode. This suggests, to me, that the lens produces images with excellent contrast across the frame. Autofocus is a bit slow, as it is with a lot of these "older" lenses, like the 70-300 and even the 18-140. So it's probably not the best tool for rapidly moving wildlife and sports shots, as the reviewers point out. But it does work well enough for almost all static subjects, except that it searches for focus at long distance subjects if there is any haze in the air. It does eventually find focus, especially if I help by manually focusing and then letting autofocus do the rest. Manual focus works better than the reviewers seem to indicate. Yes, I have to switch from AF to M. But once it's switched in, the narrow focus ring is smooth enough to obtain focus that is very nearly as good as when I use autofocus on the same subject. But, again as the reviewers point out, this is an autofocus lens, with manual only really useful to use initially to help find autofocus at long distances. My next series of tests involved driving to and wandering around a local Spanish mission. These tests, with my D7100, were not comparisons, per se. But I have taken so many earlier shots at the same locations with several lenses that I tend to remember the earlier results. My principal purpose, though, was not comparison but just to see what the lens does with a variety of subjects and its full range of focal lengths, with and without the Kenko 1.4x TC and in or out of crop mode. Again, I was surprised at how well it does. 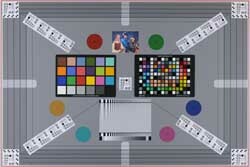 The images were almost all keepers: good resolution, contrast and color rendition. The only problem, here, is the limited utility at the low end. Since the range begins at 55mm, it's of course impossible to get anything like a wide angle view. So for walkabout, it would be necessary to carry another lens to cover that lower range, which I do anyway. In general, I'm completely happy with this lens. It does what it's supposed to do, and does it well. 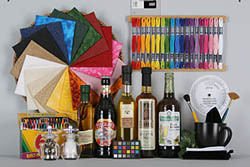 Color rendition and contrast are excellent, and resolution is also very good up to about 200mm and not bad above that. I'm able to hold it steady even at large focal lengths, but frankly the 70-300 is easier there. I have now taken many more pictures with this lens on my D7100, specifically looking for difficult subjects and conditions. In most cases, it has been pretty good to about 200 or 210mm, with or without a Kenko 1.4x TC, in or out of crop mode. So up to roughly 400mm DX net it's fine for "normal" subjects. But there are two problems using this lens at long focal lengths First, as I said before, it's very hard to hold steadily enough to entirely avoid camera motion without a tripod, which I don't use. But also autofocus with this lens, even at somewhat lower focal lengths, is not perfect on my D7100, except with high-contrast subjects. In hazy situations, I can sometimes manually focus it slightly better than to let the camera spot autofocus, e.g., shooting through mountain haze at long distances, or on other low-contrast subjects, like a band of all-black howler monkeys we ran into in Panama, last month. Still and all, though, it's a very useful, low-cost lens...if you patiently tap the shutter button for the best autofocus and hold it very steadily when taking the shot. From about 70 to 140mm, with or without the TC, in or out of crop mode, it's great. I'll get a lot of use from it. Going to Alaska.. wanted a smaller and lighter lens for some hikes in Juneau.. This lens had good reviews on a number of sites.. Handling of the lens is quite nice, somebody who is not so picky may be satisfied.. with the pics. I tried every aperture, manual and auto focus with my D7100. It does okay only at f11 fully extended at 300mm even then it is not as good as my heavy 18-300. And that is not a high bar to reach. At least it was cheap! I would say take a pass on this one. Am currently jogging two miles a day to prep for carrying my 80-400.... ah well.. Almost all portraits from http://3foto.ro are made with 55-300mm on D7000. Tele lens means no distortion and blur background. This one is going back. I got it at a huge discount with my camera purchase but I chose wrong. I should have gotten the better cheaper 55-200mm lens. I wanted the extra reach the 300mm should offer but it's only sharp up to 200mm so what's point? Ok, I guess if you aren't picky and want to zoom in but I'd like to be able to zoom in and still get a sharp picture out of it, not just an acceptable one. Now I'm screwed because I can't get the other lens at the discounted price I could have gotten it at when I bought the camera. Oh well. I did get nice pics with this lens, but it took many many not so great pics to get the few good ones. Too unreliable in my book. This lens has exceeded my expectations. From 55 up to nearly 200mm its sharpness is very comparable and only slightly less than my 70-200. At these focal lengths it's sharp wide-open and very sharp stopped down a bit. At 200-300mm it's noticeably less sharp than my 300 f2.8 but still very usable for most things. (But that's comparing $5,300 lens that weighs more than 6 pounds to a $400 lens that weighs in at just over a pound) The VRII is noticeably better than my VRI lens. It's light and small enough that I can always include it in my "pleasure-trip kit": a Nikon D5100, 12-24, 50mm f1.8G, and 55-300. That lets me take high quality stills or videos from 12mm to 300mm (18mm-450mm full-frame equivalent) in a package that weighs only about 5 pounds. Amazing! I highly recommend this lens. This lens is pretty much a longer version of the 55-200 which is a great lens in its own right. I saved over $100 by getting this lens over the 70-300mm. The zoom is smooth and image quality is as good as the venerable 70-300 VR lens, perhaps a bit better to my eyes (especially at 300mm). There's some CA as expected but nothing to worry about. VR is the second version like my 16-85mm and works very well at 300mm. The only thing I noticed about the VR is that it takes a half-second or so to stabilize, so you have to be a bit patient before you press the shutter. Auto focus is not the swiftest and is about the same as the 55-200 and perhaps not as fast as the 70-300 so this may not be a good sports lens. It's a nice light lens for its range. Build quality is okay (although the metal mount is a nice touch). The hood is a new design and snaps on to the front element (easier to put on for sure because you don't have to line up any notches). It's always loose so it rotates freely (not too easily though). To remove it, you have to depress two tabs and pull it off. I don't get the feeling this is a solid design here and worry that any bang on the hood will break it off. I'm hoping it's sturdier than it feels and I think Nikon got a little cheap here. In the end I think Nikon built a nice, light lens here and, despite some minor niggles, I prefer it over the 70-300 for my purposes (general photography - family & scenics/wildlife - no sports). If you like the 55-200 but want more reach, then this is your lens.